A villa can be described as a detached or semi-detached house, typically over 2 floors with larger examples often possessing third floor sun terraces and/or a basement. Located in Villa Martin/Los Altos , you will find this lovely villa urbanization. This small and selected new build developoment of stunning modern design houses and villas is located close to Los Alcazares with its many bars and restaurants. The historic city of .. Luxury villas with 3 bedroom and two bathrom all with seaviews, in Pilar De Horadada. Wonderful luxury villa in the best area of Torrevieja, Rico del mar. Two wonderful Luxury Villas in the best area of ​​Torrevieja Rocio del mar. Consists of 6 bedrooms, 5 bathrooms. Save from €30000 with solmardirect fairshare. Residensial SaliSol Park. Only 4 km from the beach around a beautiful nature reserve and salt lake. Villa	From € 399000 to 580,000 one house is key ready. 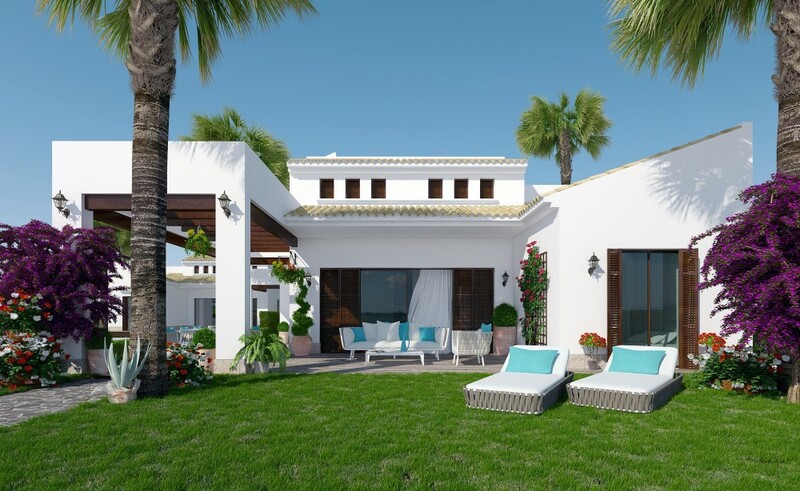 Wonderful new design villas just 250 meters from the beach in Mil Palmeras. The urbanization will consist of 18 detached villas and is located between the cities of Mil Palmeras and ..